An artist's depiction of merging black holes. The first new detection came on Monday (April 8), a week after a trio of supersensitive gravitational-wave instruments began new observations after being offline for about a year and a half, receiving technical upgrades. The new observing run also marks the first time that three different detector facilities — two Laser Interferometer Gravitational-Wave Observatory outposts in Washington state and Louisiana, plus the Virgo detector in Italy — have been observing together for a sustained period. The scientists affiliated with LIGO and Virgo were able to pinpoint a swath of sky where the signal originated, near the constellation Cassiopeia. It also appears to be coming from about 5 billion light-years away. If the signal is confirmed, the team should also be able to estimate the mass involved in the collision. Soon after announcing that signature, the detectors caught a second signal on April 12. The LIGO collaboration has not yet released any details beyond an initial map of the source. 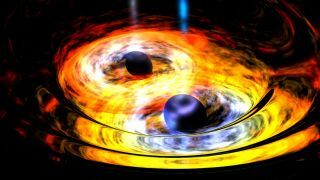 Only the gravitational-wave sensors seem to have detected the two events, which suggests they are collisions of two black holes. A collision of two neutron stars or a mixed collision would produce a light signature as well as gravitational waves. The new observing period, dubbed O3, will last for about a year.